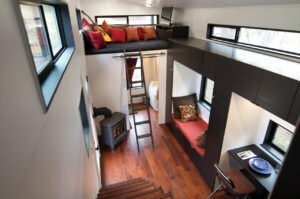 How Our $33,000 Tiny House Changed Our Lives – by Gabriella Morrison of tinyhousebuild.com. The tiny house movement has taken the nation by storm and is rapidly spreading to other countries around the globe as well. The genesis of tiny houses, as most of us picture them, came from the creative vision of a man named Jay Shafer. In the late 1990s Jay grew tired of spending winters in his Airstream which was not insulated and adapted for a midwest climate. Sparked by ideas he’d seen in some home-built RV books, he took it upon himself to design and build his own diminutive home on a trailer base. It suited his needs and saved him a ton of money over conventional housing. There’s no way that Jay, or anyone for that matter, could have predicted how much his tiny house was going to alter the very tapestry of housing in the US. Tiny houses are now bona fide, offering solutions to those in financial need, veterans, college students, environmentalists, minimalists, and more. Codes and zoning are changing at rapid speed to accommodate the swelling of interest. Outside industries are rushing to create solutions specific for tiny houses (insurance, lending, technology, construction materials, appliances, etc.). What was once a sparse desert is now a tropical and lush landscape teeming with life and opportunity. People from all walks of life become enchanted with tiny houses. Truly, with our website www.TinyHouseBuild.com as a DIY resource charged with empowering novices building their own tiny house lifestyle, we hear from people as young as 14 to as golden as 80. From homeless people who are excited to finally have the opportunity for safe shelter, to retirees who would rather save resources and live in something that isn’t wasteful. From soon to be college students who don’t want to follow in their previous generations’ footsteps towards debt, to young families who above everything else value time spent together and a lifestyle that promotes that possibility. 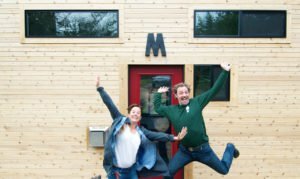 For my husband, Andrew, and I personally, we were driven to the tiny house movement after discovering that in finally achieving the infamous “American Dream” in 2009, we had paid the ultimate price: time away from our two kids, an increase in stress, and a radical deterioration of our happiness. Our new beautiful house had dismantled years of close connection as a family and a lifestyle focused on joy, health, and experiences rather than material possessions. Six months after move-in, we discovered the tiny house movement and within six months after that, we had gotten rid of the house, 90% of our worldly belongings, bought a pop up tent trailer, and moved to the tranquil beaches of Baja, Mexico to “reset”. In our 150 sq ft pop up tent trailer, we realized that while living with the least, we were experiencing the most. Our inter-personal relationships improved to their best selves ever, and the inner tranquility we felt from a slow lifestyle was so intoxicating that we struggled to come back up to the States to rejoin our lives up here. In that moment, we committed to creating a lifestyle that would best give us the possibility of success and inner calm: we decided to build a tiny house. About three years after living in Baja, we found a very inexpensive piece of acreage in beautiful southern Oregon, designed and built our tiny house, and lovingly named it “hOMe”. The cost to build it was $33,000 which included all of the appliances and furnishings. Nearly half the cost of just the DOWN PAYMENT of the average house in the US. Assuming we never move out of here, we will never, ever have another housing payment again. The amount of stress we’ve been able to alleviate through this truth has been significant. Our family of four lives on five mountaineous acres in an off-grid set up. We generate our electricity from the sun 9-10 months out of the year and rely on a gas powered generator on sunless winter days. 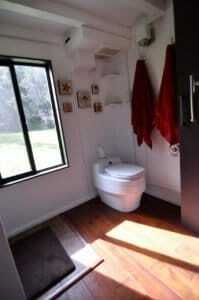 Our Separett toilet is a large part of what makes our off-grid lifestyle so successful. One never knows just how invaluable a well functioning toilet is until they don’t have one. We had tried two other composting toilets when we first moved into hOMe and they had been disasters. We have been using our Separett for over three years now and still love it. We put our waste in a three stage composting bin away from our house and allow decomposition to transform it all. No odors, easy maintenance, no crank levers, easy urine management, and a nice, sleek look. We have been living here for over 3.5 years and we continue to love it. Both Andrew and I work from home full time and we’ve found this space to be extremely conducive to a focused work environment. 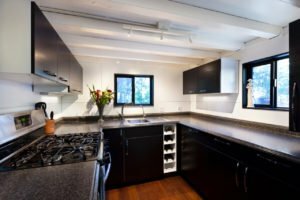 We spend a lot of time cooking and so our full sized kitchen with full appliances accommodates our active family’s needs. Our kids are 20 and 17 years old and use hOMe as their main base. Being a close family, they are often in here hanging out, watching a movie, cooking in the kitchen, and using the bathroom facilities. It’s truly amazing how well we are all able to flow through our tiny house without bumping into each other. For sleeping, both of our kids have their own small cabins right next to our place. They have no plumbing but do have power. This has been a wonderful arrangement for our family. 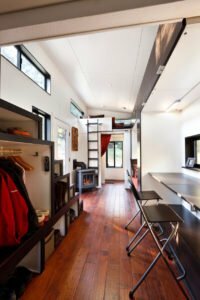 Tiny house living isn’t for everyone but our observation is that it’s a perfect fit for those that value close relationships with those they live with, those that are motivated to live a life that is economical and light on the planet, and those that are willing to deal with discomfort during a transition period. Most of us will go through a significant and often uncomfortable transition when first making the move to tiny. It’s not easy at first (it wasn’t for us) because most of us aren’t used to living in such close proximity to others. I can tell you though that after our own experience, and also from hearing from hundreds that have made the move to tiny, that the initial stage is very short and on the other side is a lifestyle that is more rewarding, peaceful, and joyful than most of us could even imagine.